There are always new things to discover and explore when it comes to Initial D. Re-watching episode 16 from First Stage, it shows Iketani goes on a date with Mako for the first time. Kenji, Itsuki and Takumi decided to follow Iketani secretly to find out who this Mako girl is. Unfortunately, Kenji had very poor following skill and somehow caught by Iketani. They pulled into a rest stop on the side of the highway. This is a real life location in 横川 (Yokokawa). 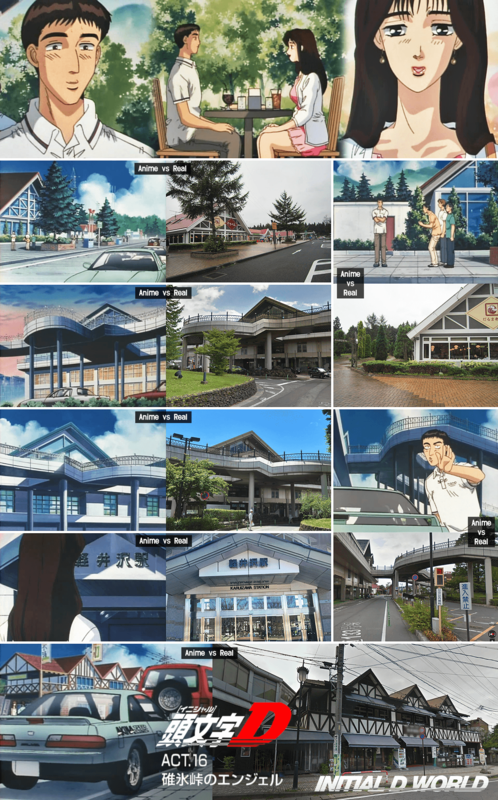 (See links below to check it out) The next scene brings us to the 軽井沢駅 (Karuizawa Station) where the three could not believe their eyes of how beautiful Mako is. The next scene brings us to a cafe where Iketani and Mako chat and hang out. There is a brief moment where it shows a real life building in the town of Karuizawa. 軽井沢 (Karuizawa) is a very beautiful resort town in the mountains near 佐久, 長野県 (Saku, Nagano Prefecture) With population less than 20,000, it's a small town that has attractions such as skiing, hot springs, golf... etc. With such realistic backdrop in Initial D, one can't help but wonder if Initial D's fame indirectly promoted tourism for Japan. It's not far-fetched to imagine that countless people visited Japan because of Initial D. Will you visit Japan one day? Where do you want go visit first? » Screenshots from Initial D First Stage ACT.16「碓氷峠のエンジェル」"The Angel of Usui"
Image size reduced, original size: 1274 x 2048. Click here to view the image in its original dimension.